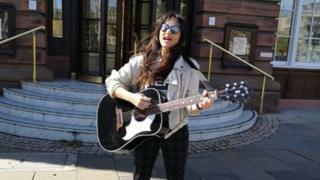 Singer KT Tunstall has performed an impromptu busking session in Dundee city centre. The Scottish musician is due to appear at Slessor Gardens in the city on Sunday evening as part of a tour with Simple Minds and The Pretenders. She posted video on her Instagram account of her joking around with two police officers who arrived as she sang and played her guitar in the street. She said, unlike when she busked in the 1990s, she hadn't been "moved along". The busking gig was to raise awareness about the Sleep in the Park event which is happening in December. KT Tunstall will perform at one of four mass sleep-outs across Scotland which will raise funds to tackle homelessness.